Welcome to the AR2Connect Fellowship of The Kings Court Parish. It is the Singles Ministry of TKC Parish! To the glory of God, the Singles Ministry has been re-launched to be more vibrant, vigilant and invigorated to support our brethren in every area of life, as they wait on the Lord for life partners. Under its anointed new name, the AR2Connect Fellowship will focus more closely on the diverse needs of our Single Men and Women across different age brackets. Social get-together/hangout events – breakfast networks, dinners, TGIF gigs, praise concerts, etc. It is indeed a prophetic declaration that our brethren are Available and Ready to Connect, and shall very soon be equally yoked with like-minded singles, IJN, Amen. Praise the Lord, Hallelujah!!! The Holy Spirit is at work in us and we shall be ushered into an era of “Swimming in His Glory”, IJN, Amen. We are formally launching the fellowship with an evening of fun and laughter in the presence of the Lord. 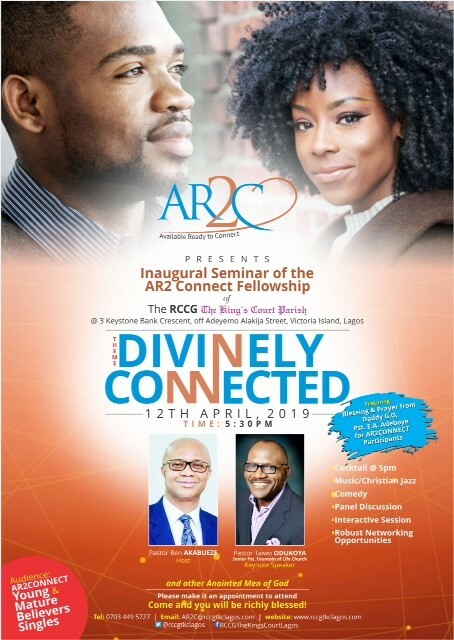 The launch will be celebrated with a Seminar themed “Divinely Connected” that will hold on Friday 12th of April 2019 at 5:30pm at the Main Auditorium of The Kings Court Parish. Anointed men of God will be there to celebrate with us, including foremost speaker on Singles Ministry, Pastor Taiwo Odukoya, Senior Pastor of the Fountain of Life Chirch. It will also feature Prayers & Blessings by Daddy G.O. It promises to be an awesome night filled with music, comedy, laughter, interactive discussions and robust networking opportunities for our Singles. Please don’t miss out on the Inauguration Seminar!!! Please share this information with other Brethren in your network that can be blessed by the Seminar and our fellowship. If you have any questions, please contact 0703 449 5727 or ar2c@rccgtkclagos.com. We invite you to check this page regularly for more details of our upcoming programmes and events. You will be richly blessed IJN, Amen.